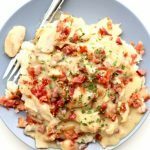 Tender bites of chicken, mushrooms and bacon with a creamy honey mustard sauce made easy in your slow cooker. Add honey, mustard, garlic and olive oil to a medium bowl. Whisk well. Add chicken and mushrooms to the slow cooker. Salt and pepper the chicken lightly. Stir the whisked mixture over the top of the chicken and mushrooms. Remove the lid and stir in the warm milk and the bacon. If you want a thicker sauce you can make a cornstarch slurry and stir it into the pot. Cook on high until sauce has thickened (about 15 minutes). Serve chicken and sauce over mashed potatoes, noodles, rice or quinoa. I used frozen boneless, skinless chicken thighs for this recipe. But you can also use thawed chicken. If you don’t like chicken thighs you can also use chicken breasts. Just cook the breasts for close to 4 hours instead of 6 hours on low. I think bone-in chicken would work wonderful with this sauce. I would just remove the skin before adding it to the slow cooker. Bone-in chicken takes longer to cook as well so I’d cook bone-in chicken for 6-8 hours on low.